When it's time to reward your ambition, discover the Aspire luxury motor coach from Entegra. 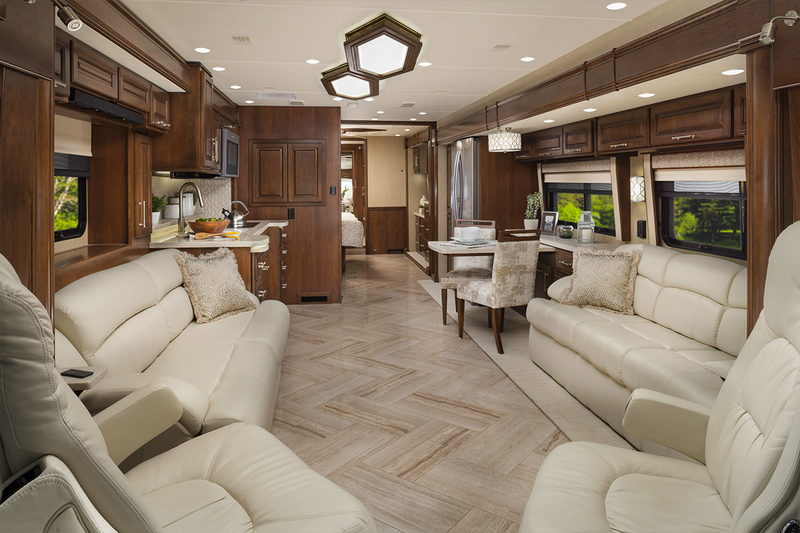 This luxury Class A diesel is beautiful inside and out. 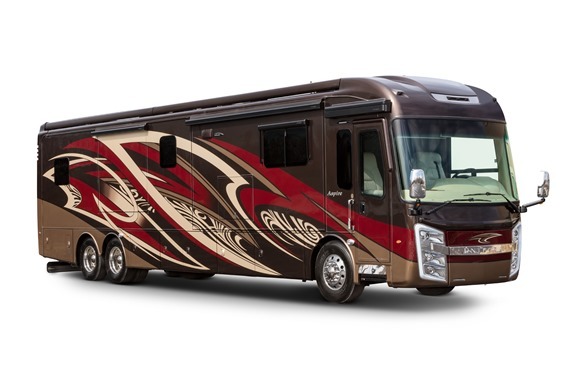 The exterior features premium paint with striking graphics, Entegra's signature C-lights, and frameless dual-pane windows. Inside you'll find porcelain tiles hand laid in a herringbone pattern, UltraLeather seating, dimmable LED lighting, and multiple Samsung LED HDTVs. 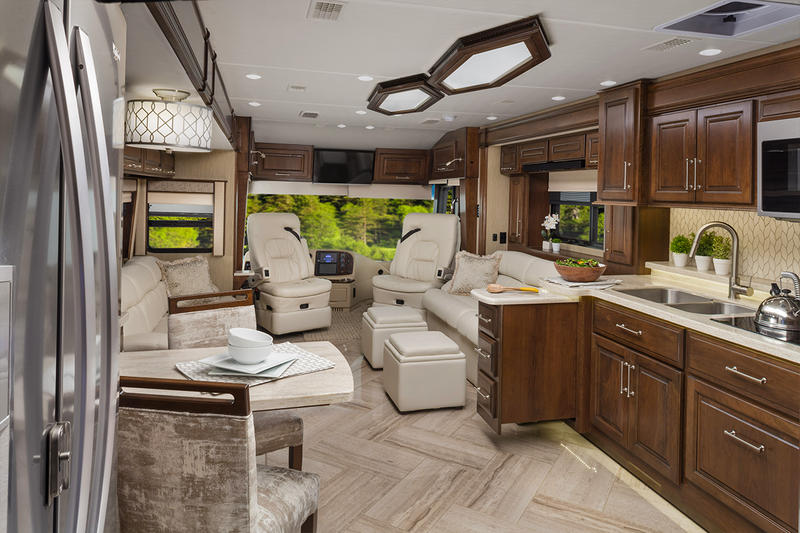 The well-equipped interior includes ample living space and optional LED lit fireplace or theater seating for ultimate comfort. The Aspire's bed, designed with a padded headboard and reading lights, will be your new oasis. The king size gel memory foam mattress will ensure you sleep peacefully no matter how far from home you travel. Smart features, like the nightstands with integrated USB ports, make recharging devices simple so you can stay connected. 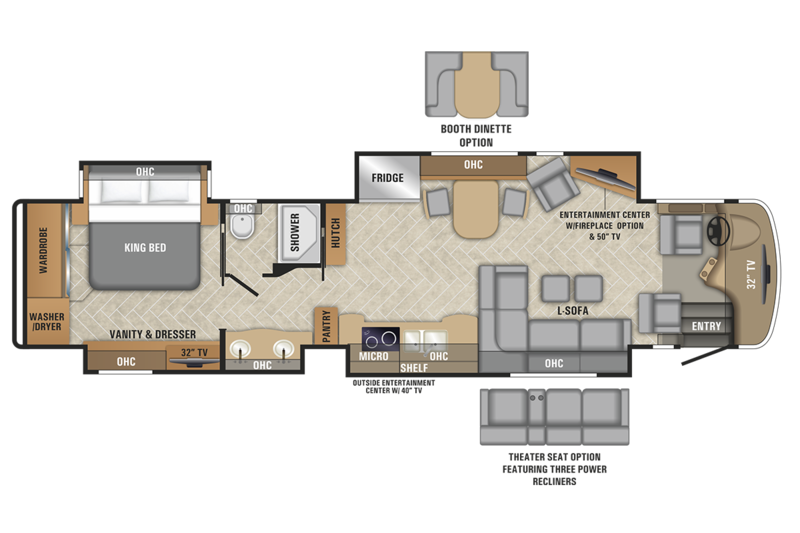 Additional amenities include storage space throughout, a large wardrobe, and high-end finishes. 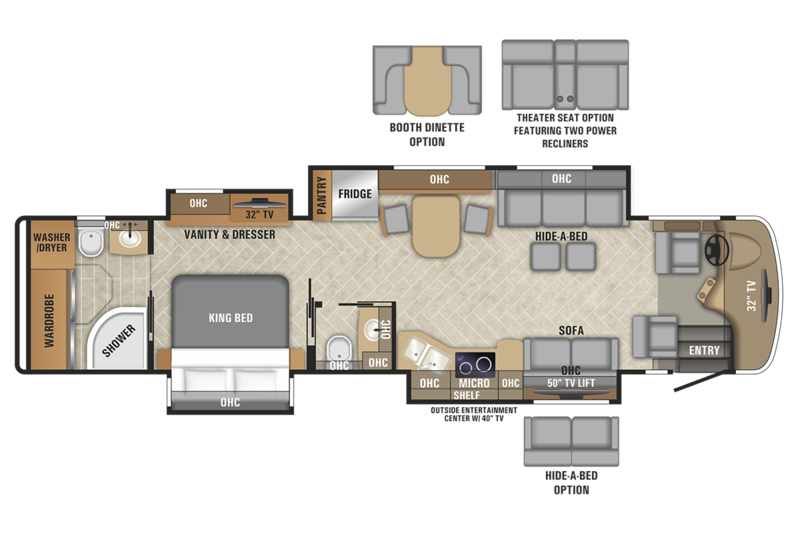 Reward yourself with the luxury motor coach you deserve. Explore the Entegra Aspire today. 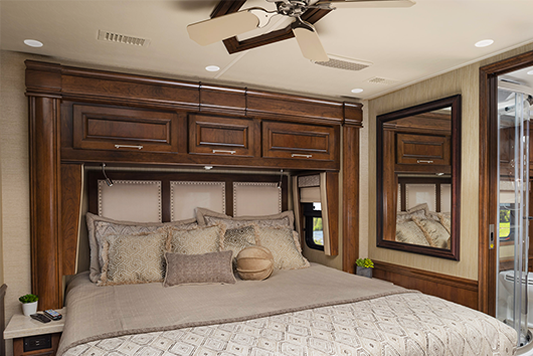 Looking for style inside and outside, plus luxurious features throughout in your next class A diesel coach? This Aspire offers just that plus some! Starting with the 6-way power, lumbar Ultraleather driver and passenger seats to the hide-a-bed sofa with ottomans and a chair, you can relax and visit with other RVers when you aren't outside sitting under the awning. After making your king bed and cleaning your clothes in the washer and dryer in the rear bedroom, you can make breakfast in the full kitchen or watch one of the two TVs in the living area. Your spouse will surely enjoy having her own sink in the dual sink bathroom, and you will enjoy the bedroom TV. There are even a few options to choose from as well. 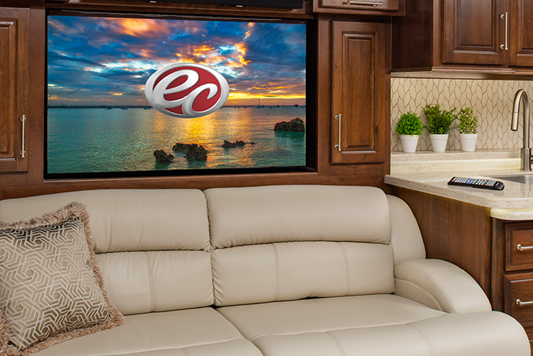 Come see what else makes this the perfect RV for your lifestyle. Each Aspire is equipped with a Spartan K2 raised rail chassis, an exclusive X-Bridge frame which eliminates chassis flex and twisting, a Cummins L9 turbocharged 450hp engine, and Reyco Granning suspension. 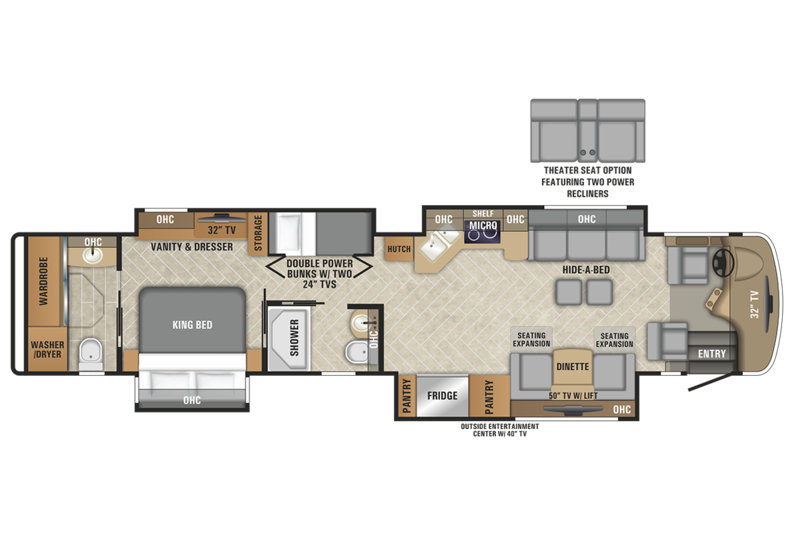 Inside you will find a high gloss porcelain tile floor hand laid in a herringbone pattern, Samsung TVs, Whirlpool appliances, plus a stacked washer and dryer and central vacuum system to keep everything tidy while traveling. There is a 2 year limited warranty and 3 year roadside assistance providing security and comfort for years of enjoyment. 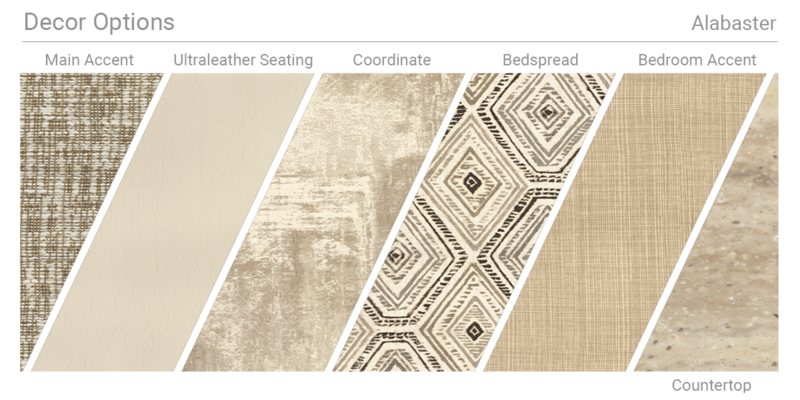 Choose your favorite floorplan and start rewarding yourself! 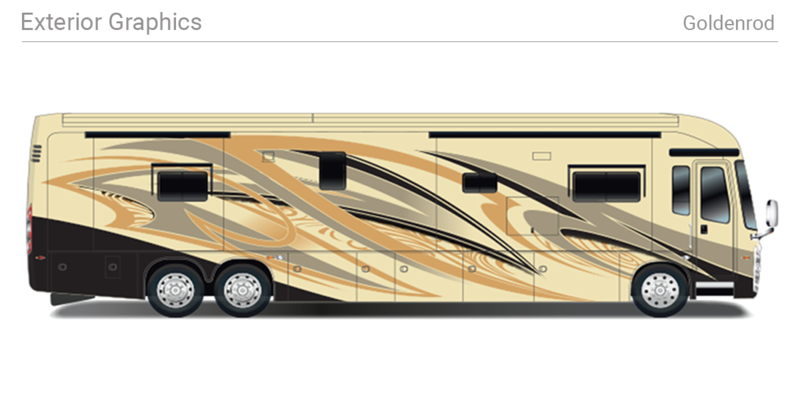 This Aspire will have you becoming a full-time RVer before you know it. 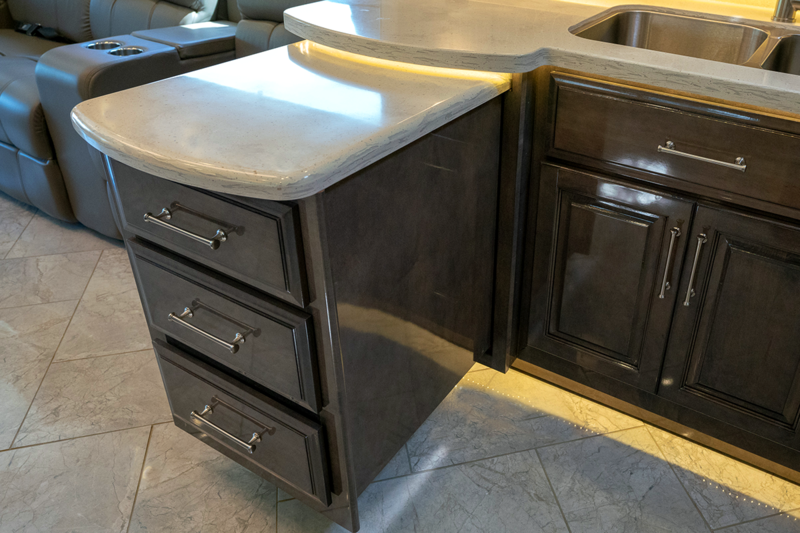 If you appreciate the finer things such as a porcelain tile floor and backsplash, solid surface countertops and a king size gel memory foam mattress, this model if for you! 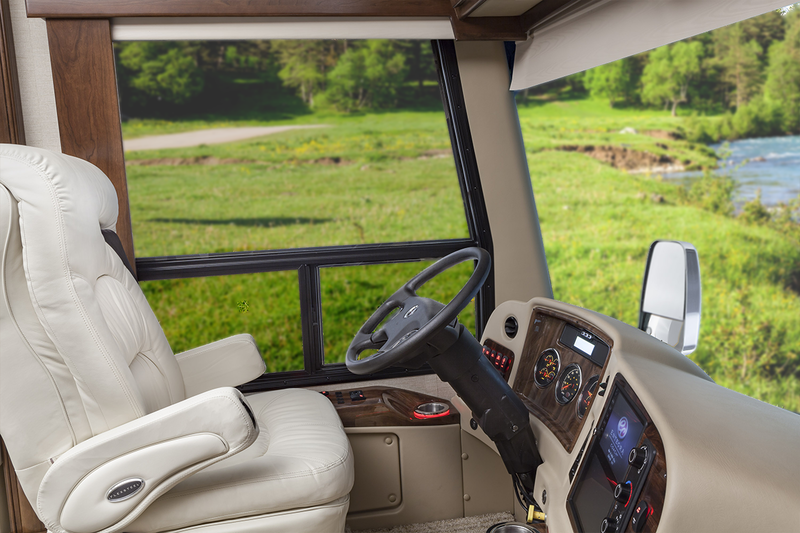 Driving down the road you can sit comfortably in the lumbar Ultraleather cab seats with 6-way power while the class A diesel takes you to far away destinations. 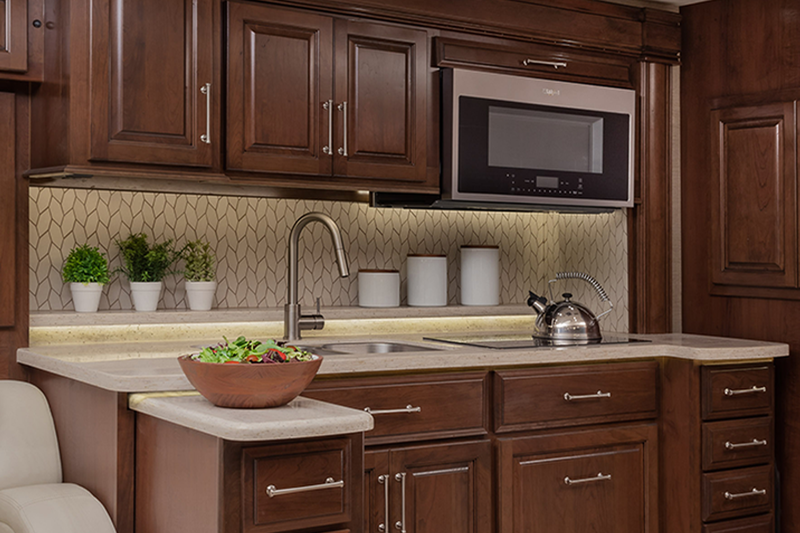 Once you are setup and ready to venture outdoors, you can grab a snack or make a quick meal in the full kitchen and store leftovers in the residential refrigerator. 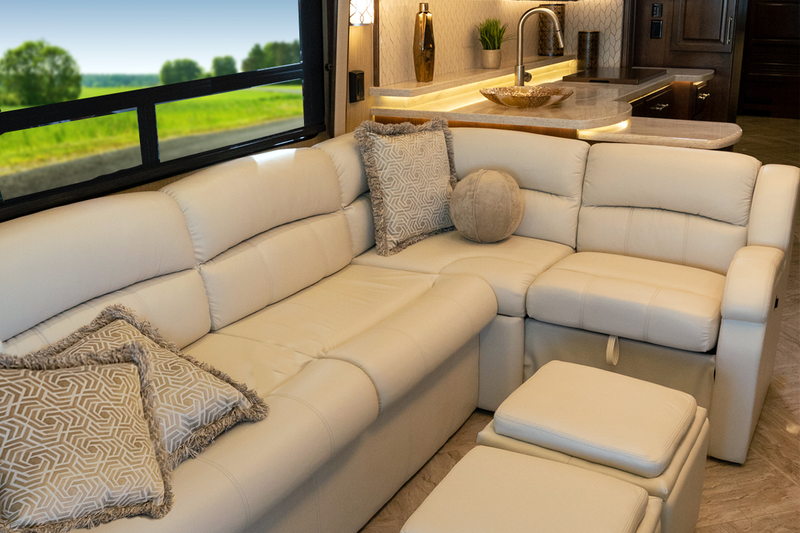 After walking in town or visiting with other RVers, you can return to your own living area to relax while seeing double... two sofas, dual ottomans, and two dinette chairs. 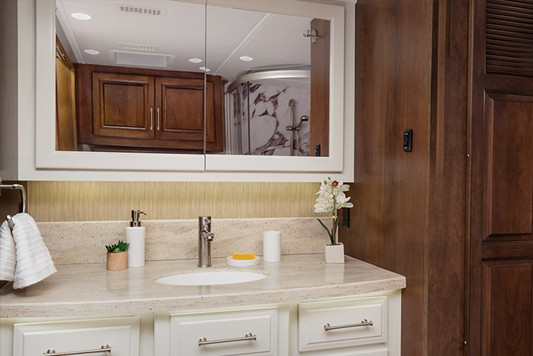 When you need to get refreshed, the rear full bathroom or mid-coach half bath are available. You might like to choose a few options such as adding theater seats or a booth dinette, the choice is yours. Take a look today! Been thinking about owning a class A coach to travel to see family and friends as well as new places? This Aspire offers a quiet ride with the best handling around to get you there in style. Inside, you will appreciate the look of the porcelain tile floor and backsplash, plus the solid surface countertops while making meals in the full kitchen with a residential refrigerator that includes an ice maker and water dispenser. Just imagine relaxing on the chair while watching the big game on the 32" TV above the cab area while your spouse relaxes on the L-shaped sofa with ottomans while watching another game on the 50" TV. She might have added the fireplace option as well. The split bath allows someone to be getting cleaned up while another is washing their hands in one of the two bath sinks, now that's convenient! Don't forget about the outdoor living area created by the awning and exterior entertainment center and TV. Stop thinking and start living your dreams! 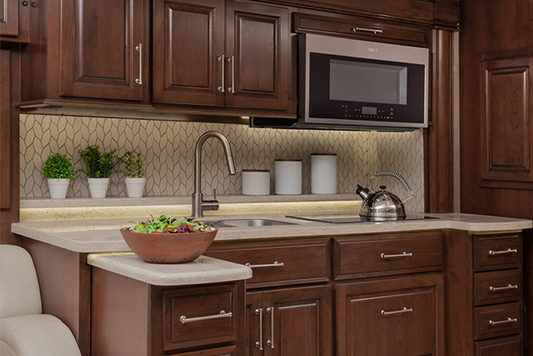 Just imagine a porcelain tile floor and backsplash, solid surface countertops, a residential refrigerator that includes an ice maker and water dispenser, and appliances to make any meal you like. You don't have to give up your way of life to travel the world. Now imagine waking up from a restful night's rest on a king size gel memory foam mattress with nightstands including USB ports and solid surface tops. You and your spouse can choose from the rear full bathroom with a washer and dryer or the half bath to get ready for the day. If you have some work to do, the free standing dinette would be a perfect setup while your spouse watches TV while sitting on the L-shaped sofa with her legs on an ottoman. If you need some outdoor time, the exterior TV under the awning might be one of your favorite spots. If you prefer a booth dinette or theater seating, you can choose that option. Take a look today! Been daydreaming about traveling with your grandkids to show them all the sights that you have enjoyed seeing through the years? 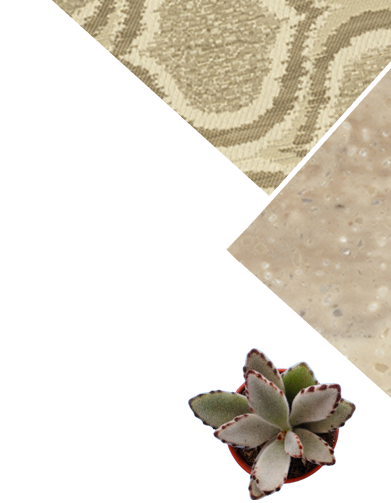 Don't want to give up the luxury you are accustomed to at home? 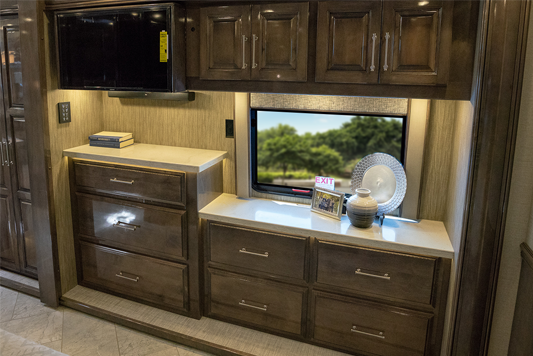 This Aspire might just encompass everything you love and want in your next class A diesel coach. 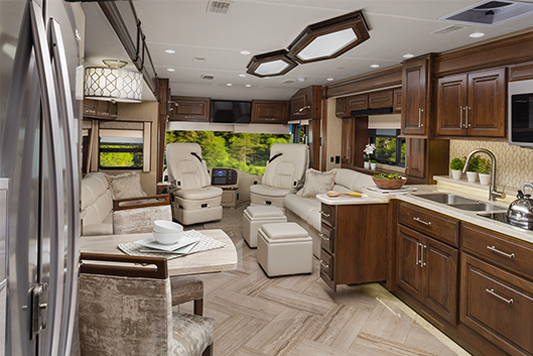 From the porcelain tile floor and backsplash, the Ultraleather furniture and cab seats, plus the residential refrigerator that includes an ice maker and water dispenser to the nightstands with USB ports for your cell phones, and the washer and dryer to keep everyone's clothes clean along the way, you will appreciate every feature. 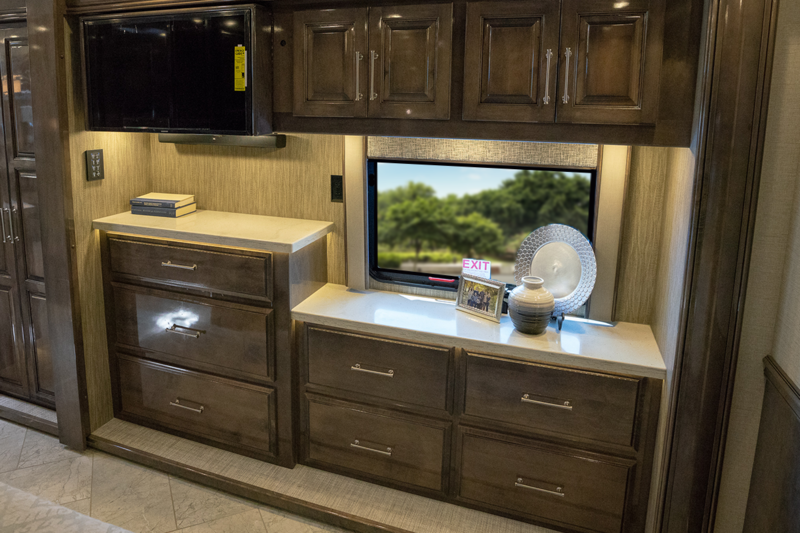 The grandkids will love their own power bunk with their own 24" TV to watch while exploring the world with you. Come see all the features that will help make each trip a memory to last a lifetime. Envision you and your spouse driving down the road in Ultraleather cab seats in a quiet, best handling class A diesel coach. 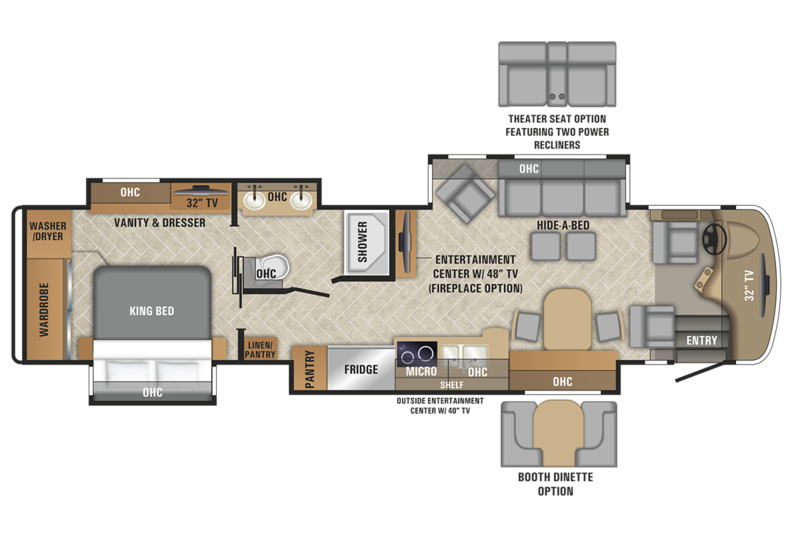 This Aspire encompasses comfort, luxury and convenience around every corner. 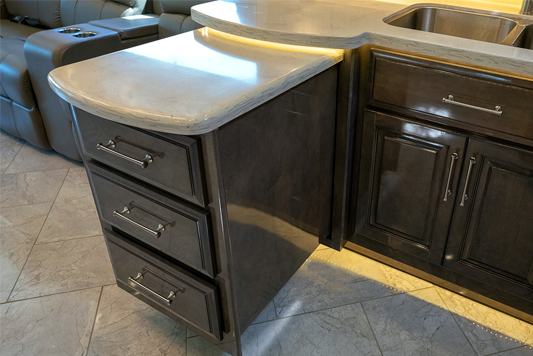 Once at your destination, your spouse will love to look of the porcelain tile floor and backsplash, the solid surface countertops in the kitchen, and the nightstands with USB ports to charge your cell phones while laying on top of the solid surface tops. 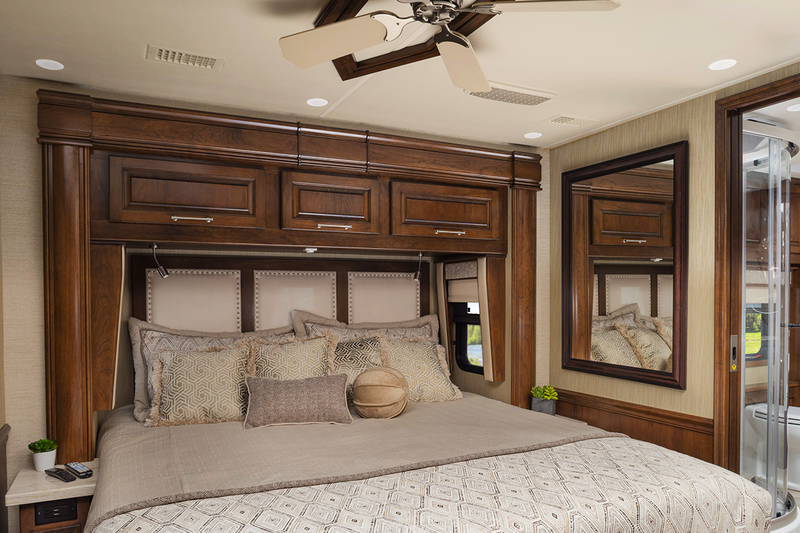 The master bedroom includes a ceiling fan to keep the air flowing just right while sleeping on your own king size gel memory foam mattress. 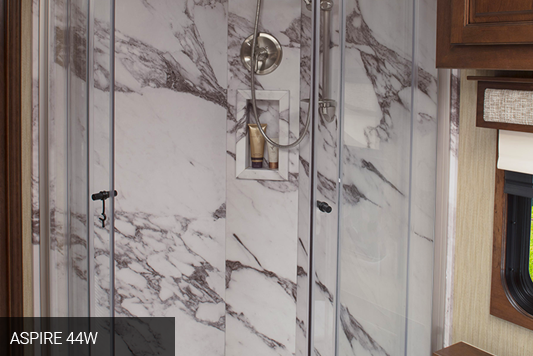 The rear full bathroom is quiet convenient at night, plus includes a washer and dryer. When you invite guests to stay the night, the hide-a-bed sofa and second sofa with dual ottomans will accommodate them. They will even have a half bath to use themselves. 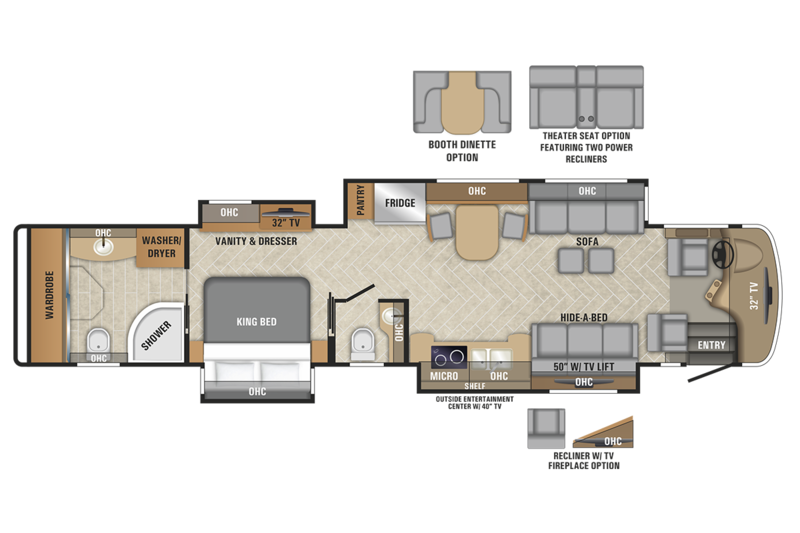 Come see the outside TV and entertainment center, plus everything else this model has to offer! 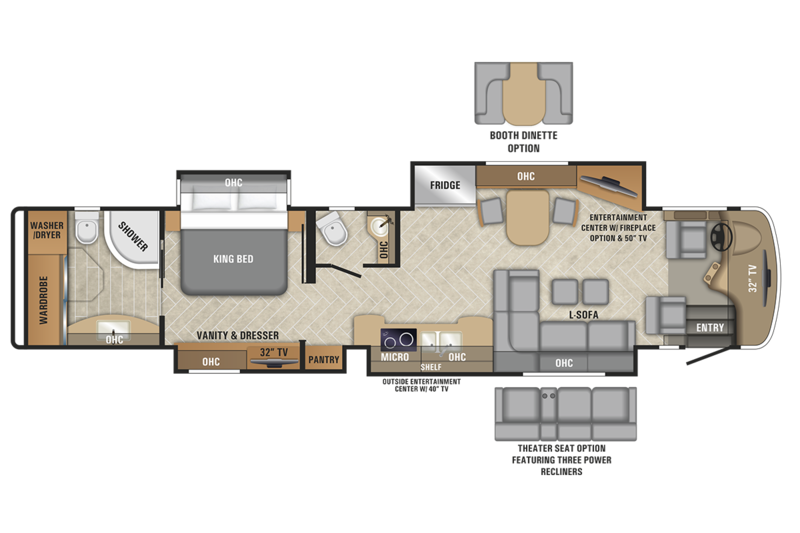 The Aspire provides maximum comfort and convenience for owners. Starting in the cockpit, the Aspire offers six-way power-adjustable UltraLeather driver and passenger seats with lumbar support. The coach also comes equipped with side cameras and digital rear cameras. In addition to the JBL premium audio system, you and your co-pilot will enjoy the dual 9-inch touch screen in-dash infotainment center. The interior of this luxury diesel is packed with high-end finishes and premium amenities, including Samsung LED HDTVs, residential-style appliances, a stacked washer and dryer, and LED accent lighting. In the bedroom, you'll enjoy a king size gel memory foam mattress and nightstands with integrated USBs for your convenience. 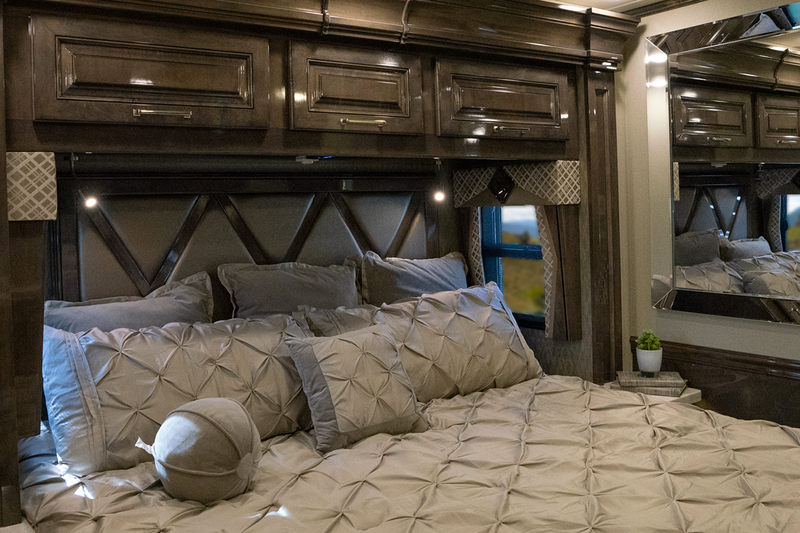 Built on a Spartan K2 raised rail chassis with a Cummins 450-HP turbo-charged engine, this luxury motor home brings high performance power. And thanks to its generous towing capacity, you can take your favorite vehicle along for the ride. Get on the road in your dream motorhome, and let our team of experts take care of the details.